The Tempest Stela is a 6-foot-tall calcite block found in the 3rd Pylon of the temple of Karnak in Thebes, modern Luxor. In a new translation of the 40-line inscription, scholars affirm previous beliefs that its description of unusual weather patterns are consistent with the massive volcano eruption of Thera (Santorini). The implications could cause a revision in chronology, particularly in relation to the reign of the pharaoh Ahmose, the first pharaoh of the 18th Dynasty. The Tempest Stela was erected by King Ahmose I, who is believed to have ruled from 1550 BC. His reign marked the beginning of the New Kingdom, a time when Egypt’s power reached its height. Egyptian pharaoh Ahmose. Photo credit: Metropolitan Museum of Art The stela describes rain, darkness and 'the sky being in storm without cessation, louder than the cries of the masses.' The great storm is described as destroying tombs, temples and pyramids in the Theban region and the work of restoration ordered by the king. The passages also describe bodies floating down the Nile like "skiffs of papyrus." Could this inscription be one of the world’s oldest weather reports and an eye-witness account of the volcanic eruption of Thera? Researchers Nadine Moeller and Robert Ritner from the Oriental Institute at the University of Chicago, believe the answer is yes. In their study, which appears in the spring issue of the Journal of Near Eastern Studies, the researchers explain that if the stela describe the aftermath of the Thera catastrophe, the correct dating of the stela and therefore Ahmose's reign, would be 30 to 50 years earlier than currently believed, a finding that could change scholars' understanding of a critical juncture in human history as Bronze Age empires realigned. "This is important to scholars of the ancient Near East and eastern Mediterranean, generally because the chronology that archaeologists use is based on the lists of Egyptian pharaohs, and this new information could adjust those dates," said Moeller. 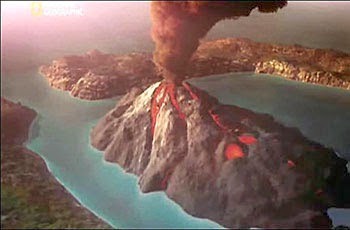 A depiction of the volcanic eruption of Thera. Image source. 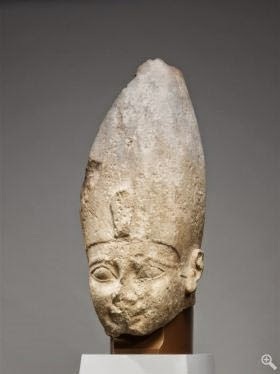 The revised dating of Ahmose's reign could mean the dates of other key events in the ancient Near East fit together more logically, scholars said. For example, David Schloen, associate professor in the Oriental Institute, says that it realigns the dates of the fall of the Canaanites and the collapse of the Babylonian Empire. The Thera eruption would have destroyed the Hyksos’ ports, weakened their sea power, and disrupted trade and agriculture, undermining the power of the Babylonian Empire, and allowing Ahmose to rise to power, taking over the Hyksos (Canaanite rules of Egypt). However, not everyone agrees with the conclusion of the study authors. 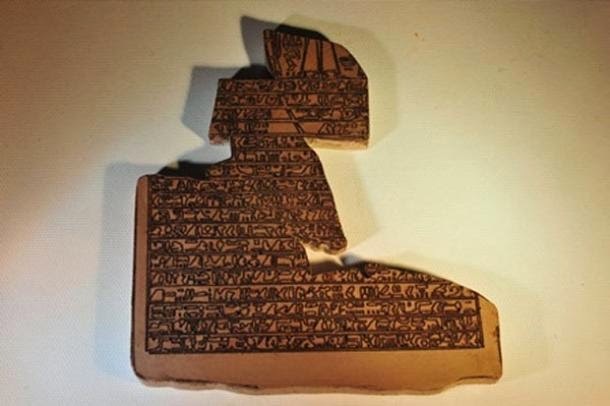 Marina Baldi, a scientist in climatology and meteorology at the Institute of Biometeorology of the National Research Council in Italy, analysed the information on the stela along with her colleagues and compared it to known weather patterns in Egypt. She believes the description could relate to the ‘Red Sea Trough’ weather pattern which, when disrupted, brings severe weather, heavy rain, and flash flooding. Other scholars, such as Egyptologist Ian Shaw believes the stela is propaganda put out by the pharaoh to rationalise a man-made disaster.